The Glassmen are pleased announce the appointment of Eric Ward as the percussion caption head for the 2007 summer season. Eric joined the team as a staff member during the 2006 season, and was an extremely positive addition to the program. 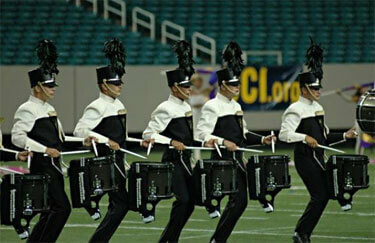 The Glassmen snare line performs in Atlanta on July 29, 2006. An accomplished teacher and clinician, Eric brings a wealth of experience teaching percussion to young people. He has spent more than a decade in the marching activity—including six years on the Cadets' percussion staff—and a year teaching with Phantom Regiment. Read more at www.glassmen.org.